Dr Turpin’s research centres on the clinical/professional reasoning of occupational therapists across the spectrum of experience from new graduates to experts, as well as the subjective experiences of people with disabilities (particularly in the area of Multiple Sclerosis). She specialises in the use of qualitative research methods and uses a variety of qualitative research methods in her own research, as well advising others on these research methods. 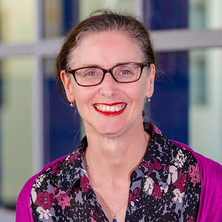 Dr Turpin has written books and book chapters on occupational therapy models of practice, evidence-based practice, and clinical reasoning, as well as publications on various aspects of people's experience. Dr Turpin has been a teaching and research academic at The University of Queensland since 1992. The connection between theory and practice is central to her research and teaching. As occupational therapists attend to both thinking and experience, they need to use rigorous thinking and a deep understanding of human experience in their practice. Dr Turpin works closely with Queensland Heath regarding supporting the clinical reasoning of occupational therapists with a range of experience. She also works with MS Qld (multiple sclerosis) to use personal and occupational therapy understandings to improve the lives of people with Multiple Sclerosis. Higgs, Joy and Turpin, Merrill (2019). Learning to use evidence to support decision making. In Joy Higgs, Gail Jensen, Stephen Loftus and Nicole Christensen (Ed. ), Clinical reasoning in the health professions 4th ed. (pp. 465-474) London, United Kingdom: Elsevier. de Jonge, Desleigh and Turpin, Merrill (2019). Models of occupational therapy. In Elizabeth Ainsworth and Desleigh de Jonge (Ed. ), An occupational therapists guide to home modification practice (pp. 41-62) Thorofare, NJ, United States: Slack . How can young people with Duchenne Muscular Dystrophy and their families be assisted to work towards a meaningful adulthood? Turpin, Merrill and Iwama, Michael K. Using occupational therapy models in practice: A fieldguide. Edited by Rita Dernetriou-Swanwick and Catherine Jackson Edinburgh, U.K.: Churchill Livingstone Elsevier, 2011. Turpin, Merrill and Copley, Jodie (2018). Interactive reasoning. In Barbara A. Boyt Schell and John W. Schell (Ed. ), Clinical and professional reasoning in occupational therapy 2nd ed. (pp. 245-260) Philadelphia, PA, United States: Wolters Kluwer. Turpin, Merrill and Hanson, Debra (2018). Learning professional reasoning in practice through fieldwork. In Barbara A. Boyt Schell and John W. Schell (Ed. ), Clinical and professional reasoning in occupational therapy 2nd ed. (pp. 439-460) Philadelphia, PA, United States: Wolters Kluwer. Turpin, Merrill (2018). Models of occupational therapy. In Elizabeth Ainsworth and Desleigh De Jonge (Ed. ), An occupational therapist’s guide to home modification practice 2nd ed. (pp. 41-61) Thorofare, NJ, United States: Slack. Copley, Jodie, Bennett, Sally and Turpin, Merrill (2017). Decision‐making for occupation‐centred practice with children. In Sylvia Rodger and Anne Kennedy-Behr (Ed. ), Occupation-centred practice with children: a practical guide for occupational therapists Second edition ed. (pp. 349-372) Oxford, United Kingdom: Wiley-Blackwell. Turpin, Merrill (2017). Occupational therapy practice models. In Michael Curtin, Mary Egan and Jo Adams (Ed. ), Occupational therapy for people experiencing illness, injury or impairment: promoting occupation and participation 7th ed. (pp. 115-133) Edinburgh, United Kingdom: Elsevier. Turpin, Merrill (2017). Occupational therapy practice models and frames of reference. In Ted Brow, Helen Bourke-Taylor, Stephen Isbel and Reinie Courtier (Ed. ), Occupational therapy in Australia: professional and practice issues (pp. 185-201) Sydney, Australia: Allen & Unwin. Turpin, Merrill and Higgs, Joy (2013). Clinical reasoning and evidence-based practice. In Tammy Hoffmann, Sally Bennet and Chris Del Mar (Ed. ), Evidence-Based Practice across the Health Professions 2nd ed. (pp. 300-317) Sydney, NSW Australia: Elsevier. Turpin, Merrill and Higgs, Joy (2010). Clinical reasoning and evidence-based practice. In Tammy Hoffmann, Sally Bennett and Chris Del Mar (Ed. ), Evidence-based practice across the health professions (pp. 300-317) Sydney, Australia: Elsevier. Turpin, Merrill J., Asano, Miho and Finlayson, Marcia (2015) Combining qualitative and quantitative data collection and analysis methods in understanding multiple sclerosis fatigue management. International Journal of Qualitative Methods, 14 2: 53-68. Hayes, L., Turpin, M. and Moran, M. (2010) Occupational therapy students' perceptions toward and experiences of fieldwork with older people. Focus on Health Professional Education, In press . Nelson, A. and Turpin, M. (2007) Book Review - The Kawa Model: Culturally Relevant Occupational Therapy. Australian Occupational Therapy Journal, 54 4: 323-324. Crabtree, Merrill (2002) A Hermeneutic Case Reconstruction of a published first-person narrative. Qualitative Research Journal, 2 3: 79-91. Turpin, Merrill, Fitzgerald, Cate and Laracy, Sue (2017). Supporting New Graduate Occupational Therapists. In: International Journal of Qualitative Methods. , , (). .
Mitchelson, K., Begg, H., Crawford, E., Barlott, T. and Turpin, M. (2016). Children seeking asylum: a qualitative study of occupational therapists' perspectives on challenges faced by children in Australian detention facilities. In: NT-QLD Division OT Conference, Brisbane, QLD, Australia, (). 28 October 2016. Turpin, Merrill (2016). Combining Perspectives: Unraveling and Integrating. In: International Journal of Qualitative Methods. , , (). .
Turpin, Merrill, Lynch, Deborah, Spermon, Deborah and Steel, Emily (2015). Preparing students for health and social care practice through inter-professional learning. In: Learning for Life and Work in a Complex World: Refereed papers from the 38th HERDSA Annual International Conference. HERDSA Annual International Conference, Melbourne, VIC, Australia, (467-476). 6-9 July 2015. King, Eva, Schull, Daniel, Green, Wendy and Turpin, Merrill (2013). Does diversity matter? Exploring the educational experience of culturally and linguistically diverse veterinary science students. In: ICCVM 2013: 7th International Conference on Communications in Veterinary Medicine, St Louis, MI, USA, (). 2-6 November, 2013. Turpin, Merrill, Brough, Rachel, Desha, Laura and Ziviani, Jenny (2013). Emergent Design Flexibility: Responding to data. In: Conference Abstracts: Presentations. Advances in Qualitative Methods Conference, Edmonton, AB United States, (723-724). 17 - 20 July 2013. Rodger, S., Turpin, M. and Springfield, E. (2012). Experiences of academic staff in using threshold concepts in occupational therapy curricula to engage students. In: Third Threshold Concepts Symposium, Dublin, Ireland, (). June 2012. Is there a lack of evidence to inform occupational therapy? Bennett, Sally, McCluskey, Annie, Caldwell, Elizabeth, Allen, Michelle, Whitehead, Mary, Cox, Ruth, Hoffmann, Tammy and Turpin Merrill (2011). Is there a lack of evidence to inform occupational therapy?. In: Occupational Therapy Australia 24th National Conference, Gold Coast, QLD, Australia, (). 29 June-1 July 2011. Organisational support for evidence-based practice: Does it help? Bennett, S., McCluskey, A., Caldwell, E., Allen, M., Whitehead, M., Ox, R., Hoffmann, T. and Turpin M. (2011). Organisational support for evidence-based practice: Does it help?. In: Occupational Therapy Australia 24th National Conference, Gold Coast, Queensland, (). 29 June-1st July. Rodger, Sylvia and Turpin, Merrill (2011). Using threshold concepts to transform entry level curricula. In: Research and Development in Higher Education: Higher Education on the Edge. 34th HERDSA Annual International Conference, Gold Coast, QLD, Australia, (263-274). 4-7 July 2011. Turpin, Merrill, De jonge, Desleigh and Moran, Monica (2008). Authentic industry based professional projects: The impact on learning. In: 13th Ottawa International Conference on Clinical Competence (Ozzawa), Melbourne, Australia, (644-644). 5 - 8 March 2008. Hayes, L., Moran, M. and Turpin, M. (2007). Exploration of the impact of a field-based learning module on occupational therapy students attitudes towards older people in a residential aged care facility. In: Proceedings of the 9th OT Australia Qld. State Conference. 9th OT Australia Queensland State Conference, Yeppoon, Queensland, (). 21-22 September 2007. Turpin, M., DeJonge, D. and Moran, M. (2007). Preparing students for work in the real world: the industry experience. In: Effective Teaching and Learning conference, Queensland University of Technology, Brisbane, (). 1-2 November 2007. Boyce, R. A., Moran, M. and Turpin, M. (2006). Doing interprofessional work in a hospital setting : the patient experience. In: All Together Better Health III: Challenges in Interprofessional Education and Practice, Imperial College, London, (). 10-12 April 2006. Turpin, M. and de Jonge, D. (2003). Action learning: Supporting professional and service development in the area of mental health. In: Abstracts for OT Australia 2nd Mental Health Conference: Mental health OT's: The talk of the town. OT Australia 2nd Mental Health Conference, Brisbane, Australia, (). 10-11 October 2003. Crabtree, M. (2001). A Hermeneutic Case Reconstruction of a Published First Person Narrative. In: Critical Issues in Qualitative Research. Critical Issues in Qualitative Research, Duxton Hotel, Melbourne, Australia, (). 3-7 July. Allen, S. M. M. and Crabtree, M. (2000). Gaining durable employment following loss of work capacity: The dilemma of concealment. In: OT Australia - Qld 6th State Conference Proceedings: Evolution Evaluation and Evidence. OT Australia - Qld 6th State Conference, Toowoomba, (2-2). 7th - 8th April 2000. Meredith, P. and Crabtree, M. (1999). The University of Queensland student placement evaluation. In: Occupational Therapists Australia 20th National Conference Program & Abstracts. Occupational Therapists Australia 20th National Conference, National Convention Centre, Canberra, (97-97). 25-28 April 1999. Turpin, Merrill June (2004). The role of analysis of narratives from a hermeneutic perspective in exploring meaning and purpose of occupation in occupational therapy PhD Thesis, School of Health and Rehabilitation Sciences, The University of Queensland. Using communication technology to enhance disability inclusive practices, access to appropriate support and the promotion of human rights within international development for persons with disability and their families. Exploring what assists new graduate paediatric occupational therapists in learning to make intervention decisions when working with children and families. Learning to interact and interacting to learn: a grounded theory of clinical workplace learning for diverse cohorts. Sources of information used by paediatric occupational therapists in Chile to make clinical decisions.